Snack Girl is ALWAYS looking for ways to makeover treats into healthy food. And, she loves banana splits! In fact, one of my favorite banana splits is served at Friendly's for a whopping 880 calories. ouch. Well, one of my Weight Watcher's buddies shared with me her secret for replacing ice cream. She just puts some whipped cream on a banana. I wasn't sure it would work but I gave it a try with the bowl and banana pictured above which features fresh strawberries that are just arriving in the stores. All I did was add about 8 tablespoons of light whipped cream to this bowl. Eight tablespoons of sweetened whipped cream (from one of those crazy nitrous oxide filled canisters) is 60 calories. The entire dish featured 1 cup sliced strawberries, 1 banana, and whipped cream. It came out to 206 calories (I saved myself 674 calories) and, honestly, I really enjoyed it. I didn't miss the ice cream. The whipped cream was enough of a "treat" for me. Of course, these canisters aren't the most eco-friendly packaging in the world. So, if you have a bit more time you can buy some light cream, add a little honey or maple syrup and just whip it up really fast. Cream is considered a high fat and and high calorie food to be avoided. But, when you add AIR the calories decrease by quite a bit. Below, I have featured my favorite whisk - a "steel ball" whisk for those with large......hands. I have to confess that I was given one of these at a foodie gig, and I fell in love with it because it is easier to use than a regular whisk. BUT, it is $23 - seems like a lot for a whisk. If you like whipping things (such as egg whites or cream) this is your tool. 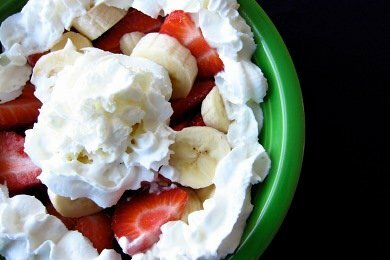 Kids will love making this faux banana split and it is a great way to dress up their after school snack. I am calculating the Points+ value with the strawberry and banana, even though they are “free”. This dessert is 1 Points+ without their calories added. Does anyone who uses Weight Watchers know if the fruit is still free when you cut them up and add whipped cream? Please help! What is your favorite lighter than ice cream treat? Slice strawberries and banana. Put in a bowl and top with whipped cream. Enjoy! The fruit is free as long as you are still losing weight. If your weight loss stops then you need to reevaluate how much fruit you are eating. You can overdo. I would not count the points for the strawberries and bananna in this dessert. I freeze the whipped topping and it has more of an ice cream consistancy. You can freeze bananas and put them into a blender to make "ice cream" too. I freeze three frozen bananas, a tablespoon of lite peanut butter and a tablespoon of cocoa, whip it together you get awesome ice cream for very little calories. I make that same banana split only I squirt a little lite Hershey's chocolate on the fruit before I put the lite Cool Whip on top. Try one of those YoNanos Machines. All you do is put frozen fruit in and the consistency comes out as soft serve icecream. Then you can add any toppings you want. Yum! This looks good. I like that you have given a reminder that there are healthier options for dessert. Whipped cream is made from cream & sugar. Ice cream is made from cream, milk & sugar. Personally, I wouldn't use the canned stuff because it usually has additives & some brands do not even have real cream in them. I don't buy ice cream very often either. I make homemade ice cream & whipped cream when I can find the time. I have found that I can eat real ice cream, whipped cream, banana splits, cookies, or anything else I want. The trick is not to over-eat anything, especially desserts. I can also eat any "fake" foods I want but I usually don't like the taste or how sick I feel after eating them. Eating either way, I do not gain weight if my portions are under control. If I eat a smaller amount of food, I can have dessert. If it's a bigger meal, I'll save dessert for another time. I have even been known to eat a "dessert" for breakfast occasionally as long as it has some nutritional benefits. Once in a while, I will have 1/4 - 1/2 cup of ice cream with fruit, nuts, whipped cream, etc. for breakfast. By the way, I have been eating whatever I want/crave for a while now & have lost 26 lbs since January. The total amount of weight I have lost is 75 lbs with about 30-40 lbs left to go. I have never felt better in my life than I do now. By the way, I can't find a lot of time to exercise so that is not the reason I can eat like this & "get away" with it. When I do get some exercise, it's usually a walk to the corner store about 4 blocks away from my house a couple of times a week. I do not starve myself. I eat when I'm hungry. I stop eating when I am satisfied (not completely full & bloated). I refuse to let myself eat for any other reason than hunger most of the time. No one is perfect. I occasionally eat too much or eat something when I'm not hungry just because I really want it. When I do, I do not beat myself up. I just won't eat another meal until I become truly hungry again. Being free to eat what I really want stops cravings & binges. I feel free & alive! Silly restrictions & light/low-fat etc makes you feel depressed & deprived. I hope this helps someone. Oh, & age has nothing to do with it either. I'll be 48 years old in May. You just have to try this machine!! Using frozen bananas as a base, which tastes just like ice cream, together with any of many other fruits which can be frozen. Mangos, berries, coconut slivers, cocoa powder if you want a chocolate flavour, peaches, best if really over-ripe, pineapple, etc. Can add frozen yoghurt also, but sugar bananas when crushed by this machine just blow me away with their similarity to ice cream. It's like fooling your brain into thinking you're eating full-fat ice cream! Not too hard to clean up, either. I just love your banana split, too. Thanks for that. I never buy ice cream, because I know that I will just gobble it all up. Of course, I still crave it all the time, and it's never in the house when I NEED it. I'm not sure if my substitution is a more healthful option, but I like to mix low-fat ricotta cheese with a little bit of sugar (usually coconut crystals because it's what I keep around), vanilla extract, and cocoa powder. It's not the same as mint chocolate chip ice cream, but it keeps me happy. Thanks for the fruit idea, and I'm intrigued by this yonana idea. What I like to do to satisfy my banana split craving is I'll take a nonfat vanilla Greek yogurt,some chopped peanuts or almonds,frozen strawberries and a little lite chocolate syrup or coco powder and layer it and make it into a parfait. If I want to make it part of my breakfast,I'll have it with a whole grain waffle like Vans or Kashi. I usually warm the frozen strawberries in the microwave to give it a more sauce like consistancy. This looks really good I will have to give it a try. For this coming up holiday I am preparing Nectarines with Meringue. I am hoping that will cut some calories. I have never heard or the Yonana machine BUT I've been blending up frozen bananas in my blender for years and adding whatever things we like/love (usually other frozen fruit or sometimes almond/peanut butter or even cocoa powder). My girls (ages 4 & 7) love it as well! We just take ripe bananas and slice them, put them on a plate and pop em into the freezer for at least 2 hours (you want them to freeze in a single layer as it is difficult to blend a whole solid-frozen banana!! But you do not need a special machine to try this, blend em up and they will turn into an ice cream like consistency!! Go for it!! Who needs the "sweet" whip cream? The fruit is sweet enough, just whip your cream without the sugar - the flavor is much better!! Light cream is an oxymoron. It's a processed food. Grass-fed milk and cream is incredibly healthy, it's full of good fats. In fact, those types of good fats help your body absorb nutrients. You are actually doing yourself a disservice by serving fruit with "light" cream. You'd be much better off serving with real, heavy cream, it would taste better, and you'd keep fuller longer. I agree with you Cristina 100%!!! Frozen bananas on a stick is our favorite at home. Cut bananas in half, skewer them, roll them in melted chocolate, toasted coconuts and almonds, and then freeze them on a tray! The best treat! No blending required! No points for fruit on WW, even if cut up and adorned with other stuff. I've lost 50+ lbs on WW in the past 6 months, and one of my go-to sweet treats is cut-up fruit dipped in a mixture of 4oz Fage nonfat Greek plain yogurt, 3tbsp light whipped cream topping (it may make purists cringe, but it's a 0-point indulgence that adds volume to the yogurt), cinnamon, vanilla flavoring/extract, and a little sweetener to taste (anything with no points!). It's filling, tastes great, and only has 1 point for the yogurt! Love the idea of frozen bananas, p.b. and cocoa. I wish I had known about frozen over-ripe bananas in the blender, but it wasn't until I got the Yonanas for birthday that I discovered them. I don't work for the company or get a kick-back for mentioning it, in case you were wondering! It just seemed like the Dole people had lots of over-ripe fruit they couldn't sell, so they got their inventors to come up with something useful to serve up all that fresh but past-sale fruit. Hey presto, Yonanas! It is just like those ice-shaving machines, only stronger, so you can feed in a whole banana, frozen for at least a day. Sour fruit, like berries, need more bananas added, and you have to blend a bit for flavour consistency. But i just love the suggestions on yoghurt and cinnamon and cocoa powder! I wish I had read stuff like this when I was needing to loose weight; it would have made the whole process more enjoyable. You just have to be organised and prepare ahead and then you're set for deserts. I want bananas on skewers too, but is it just melted, ordinary chocolate used to roll the bananas in? And where do you get coconut crystals? My mouth is watering thinking about ricotta with these! Dr TV goes on a lot about using full-fat products and naturally sweetened foods (like with agave syrup, maple syrup, honey), avoiding artificial sweeteners as they seem to trick the body and you are left unsatisfied and want to eat more. There was even some experiment where people are told food is low-fat vs a group told same food is full-fat and the first group eats more because they think they are eating fewer calories! SO they are subconsciously eating more to compensate for the perceived lower fat content. Something like that but worse is believed to be happening with the artificial sweeteners. maybe it's a good thing then, that there is no low-fat chocolate, but I imagine that a lot of chocolate is needed to coat a banana! I got my coconut crystals from my sister, whose mother-in-law orders massive quantities of organic food and shares it with her. They are the Coconut Secret brand, and they have a taste that's similar to brown sugar. She also gives me date sugar sometimes, which is very similar. For the ricotta concoction, any type of sweetener would work. As a side note, I try to stay away from agave because it's usually just as processed as all of the "bad" sweeteners out there. Just be aware that agave is not automatically a better choice because it's more "natural." That being said, it's delicious. I think my next Bed Bath and Beyond 20% off coupon needs to go toward a Yonanas machine!